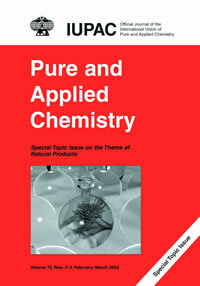 In 2002, the Bureau approved the position of a scientific editor of Pure and Applied Chemistry with the specific mandate to ensure maintenance and improvement of scientific standards, and to seek ways of shaping a publication policy that will enhance the international profile of the journal. After having served as IUPAC Special Topics editor since 1999, Prof. James Bull was appointed as scientific editor. Chemistry International asked James Bull to review the Special Topics project and his ideas for the future of PAC. It follows that the project has also sought to strongly identify IUPAC with the forefront of pure and applied chemistry, in a way that adds value and secures a distinctive publication niche for the journal in the competitive milieu of the international review literature. This implies in turn that candidate themes for special topics need to be rigorously screened in order to ensure that they meet essential criteria of mainstream currency and relevance. In practice, such projects have hitherto relied largely on individual initiatives in deciding what is appropriate and feasible. This approach, however well intentioned and well informed, is not ideal for realization of strategic goals. At first sight, special topics are merely an extension of the core business of PAC, which is to publish outputs of IUPAC-sponsored conferences and of IUPAC reports and recommendations, but it could be argued equally well that the concept points a way forward for an evolving scientific role for IUPAC. Why not consider all publishable outputs as prospective "special topics"? After all, applications for IUPAC sponsorship of international events are subjected to critical evaluation, as is the pre-publication approval of reports and recommendations. The consequent outputs are therefore eligible for special topic characterization, and need only be optimized and amplified, where appropriate, to realign PAC more purposefully with the recent and ongoing policy changes within IUPAC. In fact, the Special Topic projects of recent years reveal much potential for providing in-depth coverage and attracting more representative authorship arising from IUPAC-sponsored events. Apart from the biennial Congress, IUPAC sponsors about 20 international conferences that take place at 2- to 5-year intervals and have a record of publication in PAC. However, a significant number of these conferences have not consistently published proceedings in recent years. Furthermore, the participation levels of main lecturers in publishing their papers varies greatly from a very occasional 100% to less than 50%. This record can best be characterized as inconsistent, which invites consideration of ways to stimulate more complete participation of lecturers in publication efforts. Those with a sound publication record deserve to enjoy priority as the most appealing candidates for more in-depth publication coverage. In fact, past conference organizers have frequently seized the initiative to extend publication coverage of established events beyond the main lecture program, resulting in more definitive "symposia-in-print." This approach offers a model for more direct and active IUPAC engagement with event organizers in soliciting contributions and in managing peer review, revision, and subsequent publication. Furthermore, it has become evident that many editors and organizers would welcome such intervention. Not only would this diminish their sometimes onerous task of negotiating with prospective authors in the face of competing organizational responsibilities, but could contribute to greater efficiencies and consistency in the overall process. This new dispensation will also need to accommodate the large number of one-time and occasional IUPAC-sponsored events and the occasional projects that result in publishable compilations. During the past 6 years, more than 20 one-time and occasional events have resulted in PAC coverage. This practice will continue in accordance with the criteria stipulated in the new guidelines for IUPAC sponsorship of conferences. Two striking features have emerged from the Special Topics initiative. By opening up and actively encouraging the publication option for categories other than plenary lecturers, these projects have enjoyed significant support from other active delegates and particularly from the younger generation of chemists. Secondly, peer evaluation is not only accepted by authors, but appears to be welcomed as a familiar and reassuring prerequisite for publication. The customary practice of delegating the responsibility for peer evaluation, if any, and scientific editing of manuscripts to designated conference editors has served PAC more or less satisfactorily for many years. However, it is subject to the inevitable inconsistencies arising from differing interpretations of appropriate scientific and editorial requirements for publication, and will now be phased out in favor of a more centralized approach designed to achieve a more uniform standard. This new approach merely extends the editorial policy that has been successfully applied in promoting special topics. The practical effect of the change will be to facilitate publication, either by offering support and mediation in those cases where event organizers prefer to retain the responsibility for standards, or by engaging more directly with authors and referees where necessary. In either case, an important feature of the task will be to urge all eligible presenters to contribute manuscripts, thereby ensuring that successful IUPAC-sponsored events are faithfully captured in the publication record. The ensuing guideline attempts to summarize the approach that will be adopted for different classes of material, and suggests a timetable for implementation. IUPAC normally has the first option of publishing in PAC the papers from lectures delivered at its sponsored conferences. Exceptions include events whose outputs are customarily published in Macromolecular Symposia, and those co-sponsored events for which alternative publication arrangements are deemed to be more appropriate. The core business of PAC comprises conference proceedings of established series, and the aim is to publish a representative collection of papers based upon the main lectures of all such events. Other one-time or occasional conferences and workshops are similarly eligible but, in practice, the publication option may be waived for those that are deemed to cover very restricted areas of specialization or regional interest. Furthermore, space constraints in PAC may preclude publication of papers from all IUPAC-sponsored events, and it may be necessary to give priority to established series. All the main lecturers at eligible IUPAC sponsored events are expected to contribute manuscripts to PAC for consideration. The scientific editor will work closely with the conference editor in negotiations to improve the response level of prospective authors. Conference organizers may propose or be invited to consider extending the scope of publication to include other parts of the scientific program. This option requires prior negotiation about issues such as journal space. If such an event is deemed particularly interesting and topical it may be considered for special topic status. Wherever possible, a special topic feature will aim to occupy an entire issue of PAC. It is thus necessary to ensure that the topic warrants such exposure. Practical considerations are likely to limit special topic features to no more than three or four annually. All manuscripts originating from conference proceedings and submitted for publication in PAC will be subject to peer review. The customary practice of accepting manuscripts, subject only to approval by conference organizers, will be discontinued. Instead, the scientific editor will invite the conference editor and authors to nominate referees, who may be consulted as individuals or as a panel constituted by conference organizers. This process, and attendant author-referee mediation and management of manuscript revision, will be conducted by the scientific editor in consultation with conference organizers. The aim is to normalize an independent publication standard for PAC and, at the same time, to relieve conference organizers of an additional responsibility whilst retaining access to their specialized expertise during peer review. A new Editorial Advisory Board will be appointed to assist IUPAC in shaping and implementing publication policy and practice. Board members will be consulted regularly on publication policy and procedures, and invited to participate in peer review and to offer critical feedback on completed projects and suggestions for new initiatives. The overall responsibility for monitoring the performance and scientific standards of PAC remains with the IUPAC Committee for Paper and Electronic Publications, and a mechanism will be formulated to ensure effective communication between this body and the Editorial Advisory Board. 3 Unpublished observations. Detailed analysis of citation data for Special Topics is in progress and will be published in a future issue of CI. James R. Bull <bull@science.uct.ac.za> is a professor at the University of Cape Town in South Africa, and now scientific editor of Pure and Applied Chemistry.